What others say about their experience with chiropractic care can help you make the right health care choice. Enjoy a selection of patient reviews written about Chiropractic Works below! 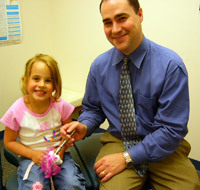 When we first visited Dr. Murray, we were convinced nothing could help our daughter’s chronic ear infections. After months of antibiotics and ear tube surgery, she still had recurrent infections. I owe so much to you and your team. Without your expertise who knows how long I may have gone on misdiagnosed. Throughout my recovery you were positive and realistic. Most of all you made sense to why I was in pain and were compassionate, something I did not find with several of the doctors I saw during my sports injury and throughout my recovery. I also want to thank your staff for their patience with my schedule, and the flexibility they gave me with last minute appointments. Thank you Debbie and Sarah. The first thing I did when I came to Raleigh about four years ago was look for a chiropractor. Not just any chiropractor, but someone I could feel comfortable with. Dr. Randy Murray is that chiropractor. Before I came here I was having lots of problems with low back pain and keeping the adjustments, which meant I was going for therapy every two weeks. Dr. Murray began treating me once a week, then every two weeks, every three weeks until it became once a month. Those treatments, over time, took several months. His goal and my goal were the once a month visits to maintain the best health. I learned that it was important to make an appointment and go in for therapy at the first sign of being out of adjustment. That practice has prevented extended pain and discomfort. Dr. Murray tries his best to be available on short notice, especially if there is pain. He is a caring doctor who takes an interest in his patients and is willing to listen to their concerns. I always feel comfortable with him. I really feel fortunate to have met him and appreciate having him as part of my overall health plan. Have a review you want to add? Post your review about Chiropractic Works for others to see! Then, contact us to schedule a time to come visit us.